Stocks remain in a major uptrend. Staying the course worked great in 2017 and remains an effective strategy even now. Witnessing a renewal of business cycle expansion, which can push annual growth above 3%. Earnings, Economy and Monetary Policy remain favorable and supportive of valuations. Risk of a more aggressive monetary policy exists for the second-half. The year 2017 will be remembered as the year when the Bulls Growled and the Bears Mooed. A year when stock market volatility for the first time ever subsided to a level below that of bonds. A year when the market refused to relent to the historical valuation templates and handed-off to 2018, a perfect record of all positive months in a year, the first time ever. It was a year when investors who observed steady patience and maintained the course were well-rewarded. Maintaining the course and staying invested was not easy, particularly with the onslaught of negative news from the political circus, and forbearing prognostications from pundits. It was a hard market to predict. Market professionals known for their prescient calls in the past, including Jeffrey Gundlach, Ray Dalio, George Soros and many other luminaries, have been predicting a sharp correction for nearly a year now, as cited in our earlier articles. Many such investors have deep institutional pockets and can still make bundles of money. For individual investors, a year or two of missing out on a strongly performing market can begin to hurt long-term performance. While 2017 faded away into the history books, it delivered a ringing endorsement of the economy and its earnings power, with the S&P 500 (SPY), Nasdaq (QQQ), and Dow (DIA) indexes delivering tall returns of +19%, +28%, and +25%, respectively. Over the same period, the Russell 2000 small cap index (IWM) lagged, recording a gain of +14%, while the Graycell Small Cap Portfolio gained +37%. During 2018, we believe the market will deliver returns in the 10-15% range for the major indexes. We anticipate a strong start to the year and believe the second-half will be more volatile for reasons discussed below. Financial markets are not easy to interpret and often defy logic. It is abundantly clear that there is a lot of swirling news that can occur which can have an impact on valuations. But for the most part, such news and its timing are hard to predict, and generally, the impact is more short-term oriented, unless it's geopolitical crisis. But tracking what we believe are the three key pillars of the stock market - Earnings, Economy and the Monetary Policy - provide a measure of clarity and a longer term viewpoint. Our optimism is rooted in the stability of these three plinths of the stock market, although there are reasons to be cautious. The Bulls will still growl in 2018, but the Bears will be allowed to sneak in a growl or two as well. As 2017 drove the point home, it was a market that was as much earnings-driven as interest-rate driven. So it is important to understand if corporate earnings will remain strong as we begin 2018. Evidence points to the strong earnings trend to persist. At this time, the fourth quarter estimate for S&P 500 companies suggests a growth rate of 10.5%, as per Factset. In all likelihood, we will once again witness this growth rate to be higher when actual earnings are reported. The two primary reasons that earnings will continue to possess fizz and remain in a rising trend are the strength of the economy and the lower corporate tax rate. At this time the S&P 500 trades at 18x forward 12-month earnings, which is above the 5-year average of 16x, as per Factset. The higher forward multiple suggests that more of the valuation expansion going forward will have to occur from earnings growth rather than multiple expansion. But it doesn't mean multiple expansion cannot occur, and more important doesn't mean it is time for a correction. Just for context, the chart below shows historical P/E multiples for S&P 500 companies based on trailing 12-month reported earnings. It will be hard to announce we are in the realm of euphoric overvaluation just based on P/E multiples. The S&P 500 earnings yield, profits expressed as a percentage of price, was 4.5% recently, compared with a yield of 2.4% for 10-year Treasuries. The spread of 2.1% has declined over the years but still remains above the average 1.5% over the past two decades. Meaning, earnings yield has continued to remain relatively strong - corporate America is delivering. There can be a few bumps for earnings, in terms of write-offs, as fourth-quarter earnings are reported. To be compliant with the new tax code, The 2017 Tax Cuts and Jobs Act, companies will have to write-off the accumulated losses of prior years on the balance sheet as the new tax code would not permit such deductions of tax-deferred assets. Citigroup (C) indicated a $20 billion write-off in the fourth quarter, Bank of America (BAC) $3 billion, and Amgen (AMGN) $6 billion, amongst many others. However, these are all non-cash charges and will not be reflected in the adjusted earnings typically used for valuations. But these bumps are not going to stop the corporate earnings machine. Earnings estimates have been rising so fast for many companies that a measure of upward-to-downward earnings revisions in the S&P 500 during a year hit the highest level since 2011. This is an earnings-supported market. The economy has been growing at a measured pace since 2016, but more recently has stepped-up to a higher growth rate. The third quarter GDP expanded by 3.2% in the final estimate. This is the best showing since the second quarter of 2015.
Business Spending has begun to rebound over the past two quarters. This is an important consideration since business spending has had a diminishing contribution since 2015. 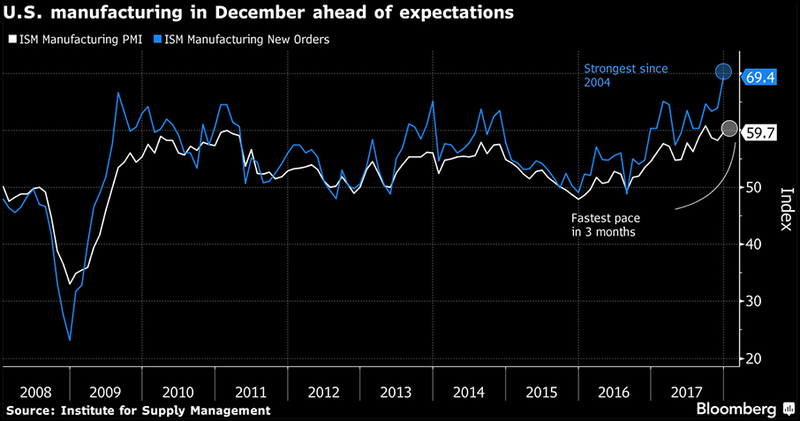 US manufacturing is reflecting the business optimism as factories are humming. As investors are aware, much of the economic growth over the past two years has been coming through the strong and resilient consumer spending. Consumer confidence in the economy has consistently recorded new highs and has persisted at that elevated level. If business spending is now gearing up as well, then the economy finally has the advantage of the twin engines of growth working in unison to push up economic growth to an annual rate of 3% and higher. Such a business cycle expansion, that we are now in the midst of, will lead to higher valuations as it expands earnings growth. 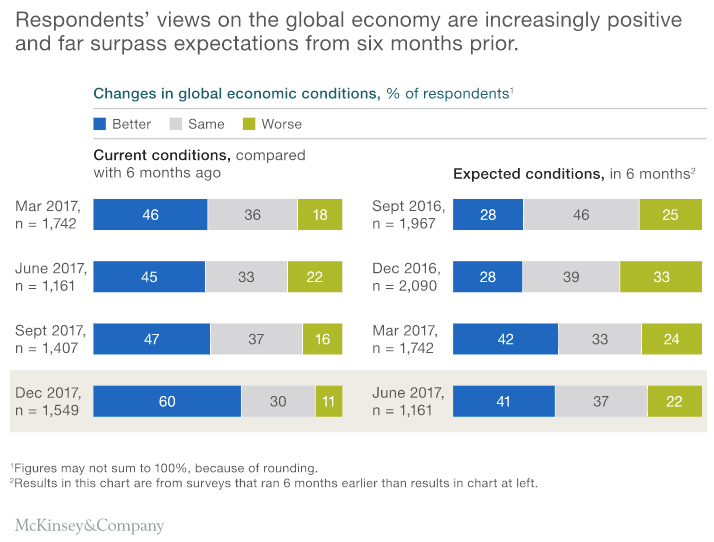 The business optimism is not just a US sentiment but reflected worldwide in key economic blocs. Business sentiment readings would suggest a continuation of synchronized world economic growth and provide a helpful tailwind to exports by large-cap US companies. The corporate tax cut is largely predicated on the argument that a tax break of such magnitude would spur business spending and elevate economic growth consistently for the long-term. Such arguments have a checkered history and have delivered higher deficits as any economic benefit has not been strong enough to overcome the sizable tax breaks. A more recent example at a State level was in Kansas, where most of the tax cuts had to be rolled back after years of ballooning deficits and not much economic growth to overcome them. With the passage of the tax cuts, the spotlight is now on the corporate sector to deliver business spending to improve wage and economic growth. Will the deep tax cuts be an example of an economic heist with not much to show in economic growth except rising deficits, or will it truly spur economic growth and make the economy more productive? Much remains to be seen, but at least the corporate sector already has a running start as business spending momentum has been building. This is an area that is becoming murkier and can have significant implications later in 2018 and beyond. The Federal Reserve has been steering the economy with a gentle hand, as it tries to find the balance between its twin statutory goals of fostering maximum employment and price stability. The expected pace of interest rate increases for 2018 is for three such quarter-point increases to a range of 2 to 2 1/4, based on the average of the expectation of FOMC Committee members. At the same time, the Federal Reserve's balance sheet normalization program is already underway since October 2017, which is rolling back the $3+ trillion that was added to the central bank's balance sheet as part of quantitative easing. This normalization drains the cash from the monetary system. As we had mentioned in the past, the normalization program can be viewed as at least one additional interest rate increase each year. However, a positive for the global and US economy is that while Federal Reserve is drawing down its balance sheet, the ECB and Japan continue to provide monetary stimulus. This prevents a concurrent contraction of central bank stimulus, which could have raised the probability of a global slowdown. If the economy has now entered a true business cycle expansion phase, as discussed earlier, then besides experiencing higher stock valuations, we most likely will also experience higher inflation. This can provoke a faster pace of interest rate increases than the 3 being currently envisioned at the FOMC. Markets can rise in a higher interest rate environment. It is the expectation of an economic slowdown and recession due to an overtight monetary policy that derails bull markets. And it isn't getting easier for the Federal Reserve. The collective wisdom reflected in the term structure of interest rates is predicting a slower economic growth environment. The longer-term interest rates have been leveling out or drifting lower at a time when short-term interest rates are forcefully rising higher, threatening a convergence of yields and then worse - a yield curve inversion. This phenomenon occurs when long-term rates fall below short-term due to bleak economic prospects and is an outcome the market always fears due to its nearly perfect record in predicting a recession. The compressing yield spread is a worrisome sign and needs to be kept under close observation. However, a yield curve inversion is a lower probability event at this time. If inflation edges higher in the second-half, the economic growth remains robust, and the Federal Reserve maintains its pace of interest rate increases, it is expected the long-end yields will rise. This process of resetting expectations may have already begun. There are a couple of others factors that will contribute to pushing the long yields higher. Rising deficits following the major tax cuts will only increase the supply of treasuries to fund the deficits, causing a natural rise in long-term yields due to market forces. Furthermore, the balance sheet normalization program drains the cash from the monetary system, and will also exert pressure on yields to edge higher. On the inflation front, the Personal Consumption Expenditure (PCE) deflator, which is the FOMC's favored inflation gauge, has been stubbornly stuck below 2%, the Committee's objective. This can be worrisome over the long-term as further slippage can allow deflationary forces to build momentum. However, if the renewed business expansion continues to unfold, then inflation should inch higher in 2018 as we progress further into the cyclical expansion. Presently, the FOMC is projecting PCE to move higher to 1.9% in 2018 from 1.7% in 2017. With manufacturing ramping-up, as shown earlier, and global growth intact, the demand for commodities or raw materials, the most immediate beneficiary of an expansion, is beginning to climb rapidly. As stockpiles dwindle, the expansion is pushing up prices. 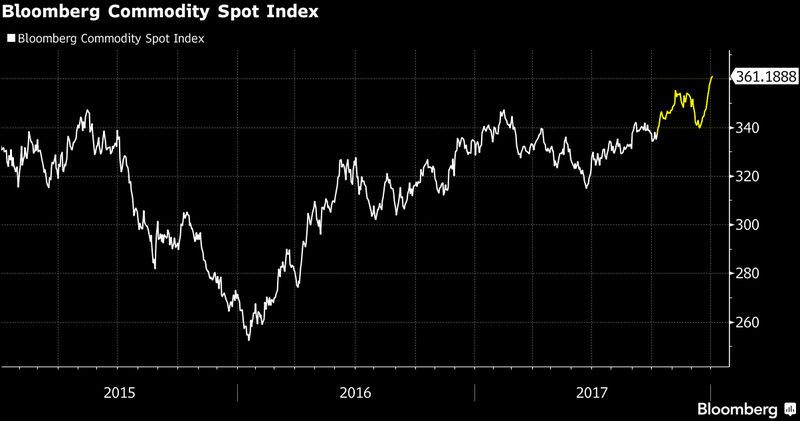 Last week, the Bloomberg Commodities Spot Index, a price gauge of 22 raw materials, jumped to its highest level in 3 years. If inflation begins to revive measurably as a result of demand expansion, the Federal Reserve's balancing act acquires even greater importance in the second-half of the year and beyond. Will the Federal Reserve find the appropriate balance of measured tightening to achieve inflation stability or will it succumb to the risk of overtightening to combat emerging inflationary pressures and consequently stifle economic growth? Not an easy question to answer, for it is indeed a challenging task. This question will assume greater importance as the year unfolds and add to the volatility in the second-half. It is not a question that only the Federal Reserve will encounter. It is a situation that most major central banks will likely face in the second-half. If inflation revives and does so at a faster pace than presently anticipated, then there will be a growing risk of central banks being provoked to raise interest rates at a more aggressive pace. The US economy appears to have enough momentum to give the Federal Reserve the benefit of some leeway in its approach. But the concurrent rising of rates in major economic blocs is a global risk that will have the force to be the tipping point for a market correction. The above possibility does not usher in a Bear market, for there is much momentum in the economy and earnings. But it does mean that the Bears get the opportunity to do a bit of growling. We believe amongst the three supports of the market, the monetary policy carries more risk of springing a negative surprise in the second-half. The above discussion on the Economy, Earnings, and Monetary Policy provides a backdrop for the stock market to perform within. It doesn't look at geopolitical risks, which can sprout anywhere and are hard to predict. Keeping in mind the above backdrop, we believe the US stock market will advance forcefully in the first-half, and continue to do so with less vigor, greater volatility, and pull-backs in the second-half. For the year 2018, we anticipate major market indexes to gain 10% to 15%. As we prefaced in the opening paragraphs, financial markets are not easy to interpret and often defy logic. Just read the market outlooks for 2017 and 2016 published on this forum, and how they diverged from reality. Markets have a way of writing their own narrative. None of our forecasts may come true, and we may be staring at a major correction or perhaps a bear market early on itself. Or inflation may remain muted, thus diminishing the monetary policy risk. Markets do not follow a calendar and change character because it is a new year. Furthermore, opinion pieces do not make money, but they provide a framework to view and guide things. Eventually, it is important to work within an investing system and continue to recalibrate the portfolio as market conditions evolve. At this time, the market conditions are favorable towards staying invested, and investors have a higher probability of securing gains. We believe on a relative basis, small caps should outperform this year after lagging last year. It was hard to compete in 2017 with rumbling mega caps like Amazon (AMZN), Facebook (FB), Alphabet (GOOG) (GOOGL), Netflix (NFLX), Microsoft (MSFT), Intel (INTC), Nvidia (NVDA), and Oracle (ORCL). The tax cuts should have a greater impact on the small cap corporate earnings due to most of the income being domestically earned. That's how we have positioned the Graycell Small Cap Portfolio, which gained 34% last year and 71% the year before, and remains fully invested. We are particularly attracted to the Biotechnology sector. With the strong market uptrend and risk appetite, one would have imagined this speculative sector to be recording new all-time highs. But it has been far from that, and the sector remains well below its last high from July 2015. In fact, if an investor would have invested in Biotechs, as represented by the Nasdaq Biotechnology Index (IBB), at the beginning of January 2016, then the portfolio would still be losing money as of the end of December 2017. The index lost -21% in 2016 and gained +21% in 2017. The Prudent Biotech Portfolio gained +7% and +35% over those two years, respectively. Recently, we published a Biotech Bonanza: Market Outlook for 2018 article which outlines the various reasons that suggest the sector can finally make an all-time high in 2018. Just a few of the promising smallcap and biotech names include Alnylam Pharmaceuticals (ALNY), Vertex Pharmaceuticals (VRTX), Sage Therapeutics (SAGE), Nektar Therapeutics (NKTR), Immunomedics (IMMU), Xunlei Limited (XNET), CVR Refining (CVRR), Spectrum Pharmaceuticals (SPPI), AnaptysBio (ANAB), Century Aluminum (CENX), Insmed (INSM), GDS Hldgs (GDS), Foundation Medicine (FMI), Esperion Therapeutics (ESPR), Arena Pharmaceuticals (ARNA), Crispr Therapeutics (CRSP), Daqo New Energy (DQ), Sorrento Therapeutics (SRNE), Juno Therapeutics (JUNO), Halozyme Therapeutics (HALO), Uniqure (QURE), Mirati Therapeutics (MRTX), Revance Therapeutics (RVNC), Cheetah Mobile (CMCM), Chegg (CHGG), GlycoMimetics (GLYC), and Abeona Therapeutics (ABEO), amongst many more. Always take a portfolio approach to investing.